Forth Picture; Christmas with the Appleyards. Note the jumper!!! 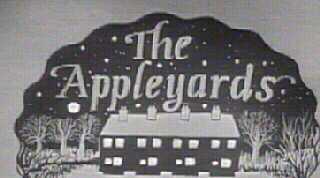 The Appleyards was a British television soap opera aimed especially for children. 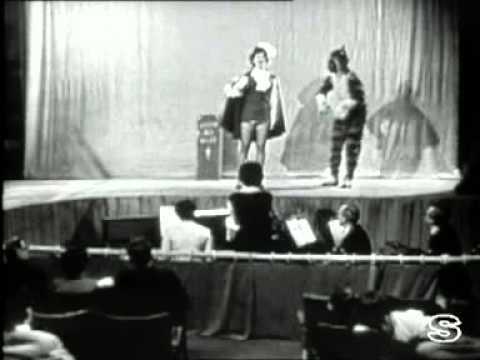 It was made and transmitted fortnightly by BBC Television from October 1952 to April 1957, from their Lime Grove Studios. It was produced and directed by Naomi Capon. Transmitted live on a Thursday afternoon from 4:30 to 5 p.m. with a Sunday repeat (which was not usually a recorded repeat of the first show but the same cast repeating a live performance). Each episode was about 20 minutes in length. 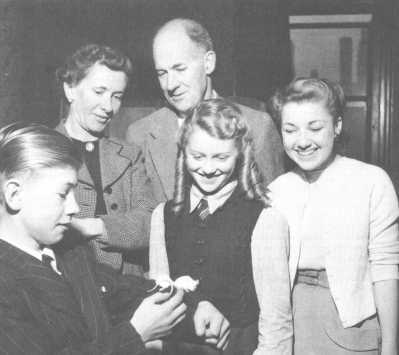 The programme told the story of the Home Counties family Mr and Mrs Appleyard and their three children: John, Margaret, and Tommy. They were usually accompanied by their neighbour and best friend Ronnie Grant. In the show's first year (1952) the episodes were aired live and never recorded, thus no episodes from the 1952 season exist. From 1953, the episodes were tele-recorded, but the BBC ended up wiping most of them. Only one episode (entitled "Family Treat" and originally aired on December 29th, 1956) of the entire run of 68 exists in television archives as of 2017, and can be found on YouTube. In the early days the theme music was piped into the studio from a 78 rpm recording. 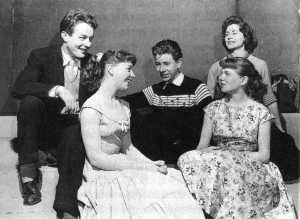 Its tales of serial ordinariness made it the junior version of the BBC’s own The Grove Family, which ran for the same period. Unlike later soaps, which continue in real time, as the younger Appleyard child actors grew, they were replaced, so in this little corner of suburban England time appeared to stand still. The title was not to the liking of the BBC Controller of Programmes, at the time, Cecil McGivern, who famously suggested that it sounded more like ‘a suet pudding with a mixture of cement’. The last episode finished with Mrs. Appleyard and Tommy sitting on a porter's trolley at the end of a railway platform, when she announced that as most of the family were now grown up it was time to end the series. It was of its time but also a ground-breaking family sitcom, popular with both adults and children alike but particularly the latter who saw it as embodiment of their own family. The catchy light music was called "Looking Around" by Colin Smith and recorded by conductor Robert Farnon. As the series developed a new character, an eccentric elderly male neighbour who was always getting into the family’s activities. He was always cadging meals and was not popular with the rest of the family but Mrs Appleyard took pity on him. Towards the end of the series the eldest son was getting married with the younger son as best man, they arrived late at the church because they could not find a bow tie for the groom and the younger son provided him with a fancy revolving one! During the wait at the church the neighbour started to sing “There I was Waiting at the Church” making himself less than popular. The programme was not the starting place for many future TV actors as “The Grove Family” was with Ruth Dunning and Christopher Beany. The cast list for “The Appleyards” did vary a bit. All a far cry from the soap Opera of today!!!! On 06/11/1960 the number one single was It's Now Or Never - Elvis Presley and the number one album was South Pacific Soundtrack. The top rated TV show was Bootsie & Snudge (Granada) and the box office smash was Psycho. A pound of today's money was worth £13.68 and Tottenham Hotspur were on the way to becoming the Season's Division 1 champions. On 06/11/1962 the number one single was Telstar - The Tornadoes and the number one album was Out of the Shadows - Shadows. The top rated TV show was The Royal Variety Performance (BBC) and the box office smash was Lawrence of Arabia. A pound of today's money was worth £12.89 and Everton were on the way to becoming the Season's Division 1 champions. On 06/11/1963 the number one single was You'll Never Walk Alone - Gerry & the Pacemakers and the number one album was Please Please Me - The Beatles. The top rated TV show was The Royal Variety Performance (ATV) and the box office smash was The Great Escape. A pound of today's money was worth £12.64 and Liverpool were on the way to becoming the Season's Division 1 champions. The big news story of the week was Beatles perform at Royal Variety Show. On 06/11/1964 the number one single was (There's) Always Something There to Remind Me - Sandy Shaw and the number one album was A Hard Day's Night - Beatles. The top rated TV show was Coronation Street (Granada) and the box office smash was Dr Strangelove. A pound of today's money was worth £12.24 and Manchester United were on the way to becoming the Season's Division 1 champions. On 06/11/1965 the number one single was Get Off Of My Cloud - Rolling Stones and the number one album was The Sound of Music Soundtrack. The top rated TV show was Coronation Street (Granada) and the box office smash was The Sound of Music. A pound of today's money was worth £11.69 and Liverpool were on the way to becoming the Season's Division 1 champions.